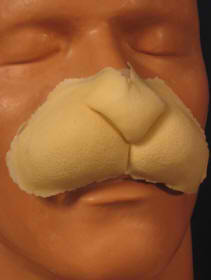 Our rabbit nose is made of soft foam latex. Thus, it looks and fits better than a solid rubber latex nose. It also is light-weight, strong and wrinkles like real skin. And because this nose is designed and fabricated by a Hollywood professional, it looks very realistic. Since this nose has extremely thin edges, it can be seamlessly blended with your real skin. In addition, it can be reused if carefully removed with rubbing alcohol and powdered before placing it in a plastic bag. Check our FREE guide on how to attach, apply makeup, remove and store your foam latex masks and appliances.